Prior to the establishment of the GrowGood urban farm on a lot across the way from the Salvation Army Bell Shelter located in Bell, CA, the shelter, which serves nearly 6,000 meals per week, incorporated very little fresh produce into its menu. “They were spending cents per meal on fresh produce. Food was donated, so no one was going hungry; but the nutritional quality was often low,” says Brad Pregerson, co-founder of GrowGood, a CA-based nonprofit that has been working with the shelter since 2011 to develop a garden-based program to not only increase the supply of fresh produce to the shelter, but also to provide its residents with meaningful work and act as catalyst for healing. The Salvation Army Bell Shelter, which opened in 1988, was established with help from Pregerson’s grandfather, Harry, a federal judge and veteran, who perceived the dire need to provide housing for the growing population of homeless veterans in Los Angeles County. Today, it houses up to 350 men, women, and veterans, who are able stay for up to two years and receive comprehensive treatment. After volunteering in the shelter’s kitchen one summer after his college graduation, Pregerson recognized an opportunity to solve the fresh produce deficit at the shelter and improve the health and well-being of its residents. “Bell is in an industrial part of the county. It’s only eight miles from Downtown Los Angeles (DTLA), but there aren’t a lot of green spaces,” says Pregerson. To tackle this environmental challenge, he and his partner in GrowGood, Andrew Hunt, installed several raised bed gardens on the property across from the shelter using imported soil. The farm, which now occupies close to two acres of land, has been able to rehabilitate the soil through the process of biodynamics, a farming ideology that posits that a diversified and balanced farm ecosystem will generate nutrient-rich, self-sustaining fertility, and health. This diversity includes animals, perennials, native plants, medicinal herbs, and livestock along with the other crops grown on the farm, such as carrots, radishes, beets, lettuce, kale, chard, and hard-neck squashes, to name a few. The farms no-till system acknowledges the interaction of these variables, lending to the notion that the systems in the soil work better when left alone, something McAndrews calls the ultimate humility. The improvement of the soil is one of the major factors in the farm’s ability to produce more food for the shelter. In 2015, the farm was able to provide 2400 pounds of produce to the shelter’s kitchen, and they are on pace to break 7000 pounds in 2016. McAndrews believes that number will more than double for 2017, estimating close to 20,000 pounds. Another part of this essential biodynamic system is the human factor, which McAndrews says contributes to the therapeutic objectives of the farm. Inevitably, the human factor also involves inefficiencies in the way the farm is tended, but those inefficiencies are intentional and part of the biodynamic process. The hope for the future is to maximize that potential by creating systems to bring more people from the shelter to the farm to participate as stewards of the natural process. A new grant from the Disney Foundation will be used to support that mission by enabling the creation of a commercial greenhouse on the property. The greenhouse will increase GrowGood’s revenue by allowing it to grow and sell micro greens and specialty greens to restaurants in Downtown Los Angeles. This revenue will in turn help to pay some of the shelter’s residents for their work on the farm, and provide additional funding to increase educational and job-training opportunities. 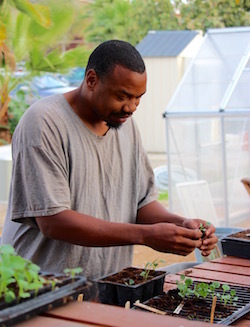 “The job training and being able to put money in the residents’ pockets is so critical, and the components of our program will really grow once the greenhouse is up,” says Pregerson. Currently, much of the job training involves helping residents develop awareness about their limitations for work and understanding of what they need to succeed in the workforce, such as communicating, being on time, conflict resolution, accountability, and confidence. With the implementation of the commercial greenhouse enterprise, Pregerson will increase that training to include every stage of the business, from sales to delivery. GrowGood is also looking to create more revenue through Farm-to-Table dinners as outreach fundraising marketing events, the first of which will be held in February. The hope for the future is to create a sustainable and replicable model that can be used for more sites like the one at the Bell shelter and engage more foundations and donors.